the Central and Coastal Flyways. Central (and larger) Flyway is generally most active from early to late October. Conversely, the Coastal Flyway is generally active from mid October to mid November. Question, are these flyways "real" and if so, why the asynchronicity? Recapping the fall 2007 monarch migration. Monarchs start heading south in late August. The monarch front appears somewhat asynchronous at this time. By mid October, monarchs pour through the Central Flyway. 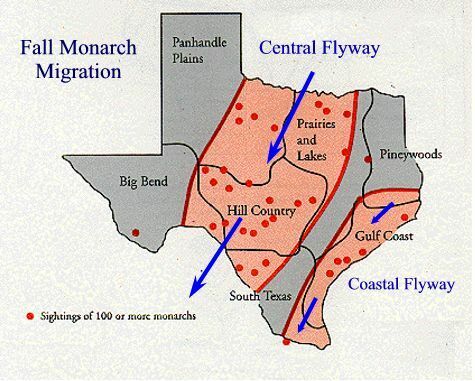 This major monarch migration corridor generally extends from I-35 to Midland. During the third week of October, the monarch flow appears to shift to the southeast. At this time, monarchs occupy portions of the Central and Coastal Flyways. By the last week of October, monarchs are primarily restricted to the Coastal Flyway. and is generally active from mid October to mid November. the mystery of the origin of the coastal monarchs, but they likely started in the northeast. versus monarchs traveling a shorter distance from the midwest and using the Central Flyway. such a route would encounter more cross winds than midwestern originating monarchs. Some monarchs will overwinter all along the Gulf Coast. Is it possible that the impetus to continue migrating is lost due to the lateness of their arrival?